When looking at the budget fights the Americans are currently embroiled in, it's important to ignore the spin from both sides and remember what it is they spend their money on. If ever there was a case to be made that the Military Industrial Complex has taken over and has far too much influence on American policy, both foreign and domestic, it's contained in the numbers below which were put together by the non-partisan National Priorities Project. 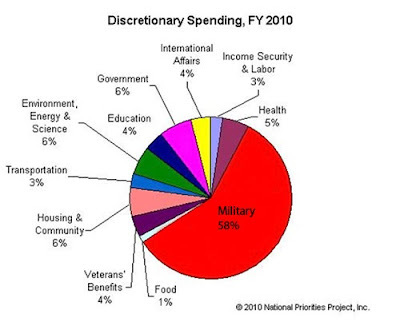 As you can see, there's 5% for health, 4% for education, 6% for environment, energy and science and other piddling percentages for things that should be considered important but so far as Discretionary Spending goes they spend the bulk of it on their military. A stunning 58% of the US budgeted discretionary spending goes to fuel the war-machine at a time when 59 million Americans have no health insurance, 132 million are without any dental insurance, their social programs are being cut to the bone and there's even talk of ending social security as they know it. The icing on this cake is for all the talk there is from the Republicans about cutting programs and reducing spending, none of them wants to sit on the Appropriations Committee which controls all discretionary spending because none of them has the balls to actually cut the popular programs they're always calling for an end to because it would likely cost them their seat in the next election. UPDATED: It has been pointed out to me that this post may be misleading and so I want to clear it up. Discretionary spending was $1.39 trillion, or 38% of total spending of the US budget in FY 2010. It is that part of the U.S. Federal Budget that is negotiated between the President and Congress each year as part of the budget process. It includes everything that is not in the mandatory budget, which are programs required by law to provide certain benefits, such as Social Security and Medicare. 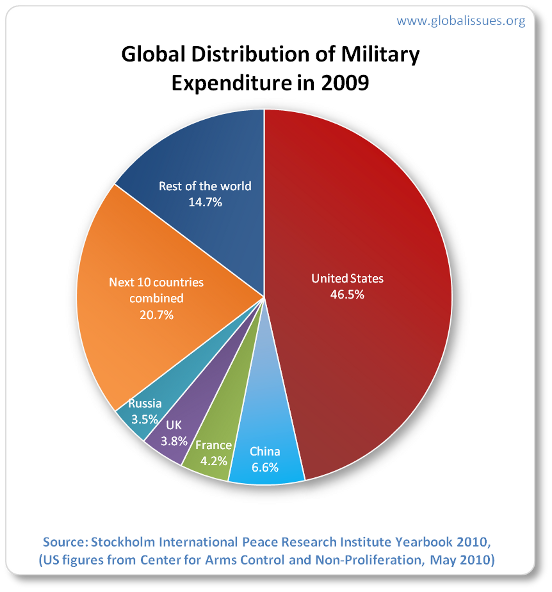 This does not include many military-related items that are outside of the Defense Department budget, such as nuclear weapons research, maintenance, cleanup, and production, which is in the Department of Energy budget, Veterans Affairs, the Treasury Department's payments in pensions to military retirees and widows and their families, interest on debt incurred in past wars, or State Department financing of foreign arms sales and militarily-related development assistance. Neither does it include defense spending that is not military in nature, such as the Department of Homeland Security, counter-terrorism spending by the FBI, and intelligence-gathering spending by NASA. The upshot of all this is that our American cousins devote an enormous amount of money on weaponry when they already have the capability of completely destroying the world and several other worlds too if they could reach them (the earth can only be destroyed once!). It's never enough however, because as I write there are Americans in Congress getting ready to scuttle Obama's New START nuclear arms reduction treaty with Russia without which the U.S. will be unable to monitor Russia’s nuclear arsenal as it has since the end of the Cold War, potentially creating significant nuclear instability. One of the reasons for doing this according to Senator Lindsey Graham is, ...we need to modernize our nuclear force, the weapons left, to make sure they continue to be a deterrent and make sure we can deploy missile defense systems apart from START. So you got two stumbling blocks, the modernization program and how missile defense works apart from the treaty. So, keeping in mind that poverty levels in the US continue on an upwards trend and this spending takes place in the shadow of children without food, schools, heat and people without jobs you can see what an enormous waste and lost opportunity this wanton military spending represents. Also keep in mind that the poverty level is defined as being at approximately $22,000 for a family of four which is a very low threshold. Below is a chart comparing what the US spends on military budgets as compared with what the rest of the world spends. For a more complete picture you can go have a look over to GlobalIssues.org. This is a subject explored in great depth by retired U.S. Army colonel turned professor Andrew Bacevich in his books "Washington Rules, America's Path to Permanent War" and "The New American Militarism, How Americans are Seduced by War." Bacevich reveals in detail how Christian fundamentalists, neo-conservatives, the military/industrial/war waging complex and the Pentagon have forged an unprecedented alliance based on merged interests. It's at once brilliant and scary. This same topic is also addressed by historian, professor Chalmers Johnson, in "Dismantling the Empire, America's Last Best Hope" and "Nemesis, the Last Days of the American Republic." If you're interested I have reviews of these books at The Disaffected Lib. Thanks Mound! I appreciate the comments and tips on books. I'll make my over to your site and find the reviews poste haste. Cheers!